For some reason certain celebrities have taken it upon themselves to, having no other qualification than personal brand recognition, opine and lecture the rest of us on how we should live our lives. The following celebrities, however, don't know sh*t, and while I appreciate and am sometimes amused by their opinions and favourite causes, I do not feel obligated to govern myself accordingly. In no particular order, these people are NOT THE BOSS OF ME! I will, however, do whatever Don Cherry tells me to do (on the ice). Sadly, none of these things exist in Windsor any longer, although there is some hope that if we can get Eddie to express a passing interest in Doonesbury in the quiet of the Mayor's office, the Windsor Star will somehow get wind of it and print Doonesbury on the front page daily. (Yes, he's going to win the election). 3. Earned Starbucks points on every purchase, which were then loaded on to the Starbucks side of this one single piece of plastic, code name Duetto. Nirvana! Grande Nirvana! Then they discontinued the card, proving that there are no free refills in the coffee shop of life. Enjoy every cup as if it will be your last, I say. I have grounds to believe that one day it will be. Anyhoo... the first goal is beyond my control: I want grey hair before I have no hair. Currently it's anybody's guess on which will come first. I have enough forehead for four heads, so I wouldn't put my money in silver, if you catch which way the combover is heading. But the other, real but seemingly impossible goal, is to get triple points on my credit card. Here's what I mean. Right now I collect points on every purchase through my credit card company, and through whatever loyalty programs to which I belong. To give an example, if I buy my shampoo (for the remaining time I will need shampoo) at Shoppers Drug Mart and use my VISA, then I will get VISA points and Optimum points - that's a two-fer. If I check into a Holiday Inn and pay on VISA, I get credit card points and Priority Club points, which I will later redeem for upgrades or a free room. Same for VIA rail - credit card and VIA Preference - two-fer! Shell gasoline by credit card? Two-fer: credit card points which I will someday redeem for a big screen TV and Air Miles (which we occasionally cash in for Starbucks gift certificates. Don't judge me). I'm looking for the elusive third reward. Credit card points, loyalty rewards points and...what? This, then, is my new quest in life. A perfect three-pointer on the loyalty program court of life. OK, so I don't have big dreams. I do have lots of little ones which, like points programs, can add up. 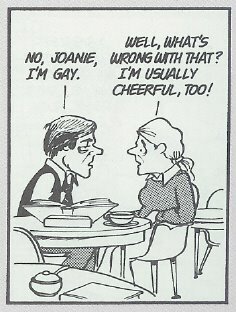 I understand the homosexual community’s abhorrence of the word “gay” being used as a pejorative. It’s wrong, particularly when it is used in the homosexual connotation. There once was another. Can the homosexual community appreciate some of us are pretty pissed that the homosexual agenda commandeered the word “gay” to describe a sexual orientation, and for some a chosen lifestyle, that at the time and for some even today is anything but “happy”? We want our word back. When I say “we”, I refer to lovers of the English language, regardless of sexual orientation. No other word in the language more accurately, and succinctly describes “having or showing a merry, lively mood”, which I guess I haven’t had since the 70s, thank you very much. From now on I will assume that any man who describes himself as gay is gleeful, jovial, glad, joyous, happy, cheerful, sprightly, blithe, airy, light-hearted; vivacious, frolicsome, sportive, or hilarious. It would be laughable, if it weren't so frightening, that the homosexual agenda is chastising Vince Vaughan and anyone else who uses the phrase "that's so gay", after hijacking the word for their own use and now vociferously objecting to anyone else doing exactly the same thing with the same word. One hopes that reasonable minds will prevail and it will, as they say, get better. This rescue which we all celebrate is both private, and public and even more, an example for us all. The Bishops of Chile says the nation is celebrating a type of Easter. Here’s what they said. "A grateful and emotional nation followed Operation St. Lawrence in detail," (Note the name of the rescue effort, St. Lawrence, a deacon by the way, but apparently considered in Chili to be the patron saint of miners), and in the midst of the rescue, the bishops invited communities to "pray and thank the God of life for this Easter moment of which we are witnesses." "Men and women, children and elderly, whole families took to the streets to celebrate, people could be heard crying: 'They are alive, they are alive! Thank God!' "Everyone wanted to proclaim the good news, everyone wanted to comment on it, all rejoiced and were overwhelmed with the announcement that life had triumphed over the worst predictions of death and tragedy." That, my friends, is the same triumph of life over death we celebrate each time we gather for the Eucharist. Wouldn’t it be nice to celebrate Easter 2011 as joyously as the families of the miners, and the people of Chile? With election season in full swing and candidate signs popping up all over, I propose a new strategy for that would allow the incumbent mayor and individual council members an opportunity to really show what they have done for our fair city, and what they have not done. They should paper over the vacant store windows downtown with their election signs, for starters. This will require them to order extra signs, as there are a lot of empty storefronts in downtown Windsor. I wouldn’t mention it except that it hasn’t gotten any better in the last 7 years since this Mayor became head of council. I wouldn't mention it except that downtown is not a priority and it needs to be for the sake of tourism, for industry and for our citizens alike. In each ward I’d like to see the incumbents plant their lawn signs in front of deserted, vacant, burned out and boarded up house. Again, a lot of signs will be needed in some wards, particularly in the ones I walk through on my way to work every day. Our incumbents seem quite proud of the work they’ve done; it’s time to stand trial at the ballot box for what they haven’t done. Seven years ago a candidate for council, who was defeated, stood in front of a burned out apartment building during a televised CBC election video piece and pledged to care about urban blight, indicating the building behind him as an example. He was defeated and the subject has rarely come up since. Two elections later, those same burned out buildings stand boarded up. Don't get me wrong. Our incumbents should take credit for all the good work they’ve done, but they should also take a stand and defend what they have failed to do. Our outgoing council is proud of keeping our taxes in line. They boast about going through the budget line-by-line. Our next Mayor and Council wouldn’t consider going through the city street-by-street in the same fashion, would you?